Ruby produces perhaps the largest fruit of any Mirabelle or Cherry Plum. The flesh is dark red and has a peach-like flavour, and can be eaten fresh although like all mirabelles and cherry plums it is mainly used for cooking. Hybrids between various plum species are quite common, and the large fruit size and red-flesh suggests that Ruby may have some relation to the popular Japanese plums. Ruby® is a protected variety. Please fill in the details below and we will let you know when Ruby mirabelle trees are back in stock. Ruby is in flowering group 1. Ruby is partially self-fertile, but fruiting will be improved if there is a compatible tree of a different variety nearby. 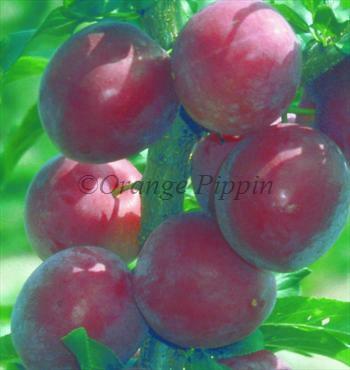 Ruby grows in a more upright habit than other Mirabelles and Cherry Plums, more similar to a plum. This variety is particularly suited to the UK climate. As well as the pollination partners mentioned above, Ruby will also cross-pollinate with most early-flowering Plum and Damson varieties.